Search homes for sale in Westport, an active adult community in Belmar NJ. 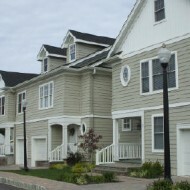 Westport at Belmar is a townhouse community in Belmar, Monmouth County, NJ The townhouses have 2 bedrooms, 2.5 baths and a garage. A private elevator was an option to the original buyer. These townhouses come equipped with designer kitchens, granite counter tops in addition to many more designer features. 23 homes are in this community. In fact, this is an Active Adult community for people over 50 rather than the usual 55. Westport is in a beachfront town, located near the ocean and just a short walk to the marina in the Shark River.It’s in a great location because the train station is within walking distance. Call to see the active adult community homes for sale. Would you rather search for a condo in Belmar?